This morning I made a bowl of oatmeal and it started as an ordinary bowl of steel cut oats until I decided to transform it into Banana Bread Oatmeal. It was a bowl of oatmeal that was too good not to share with you all! My daughter scarfed it up, and even my hubby who isn't the biggest fan of oats loved it! Score! It was relatively simple, the longest part being the cooking of the steel cut oats, which take longer than the old fashioned variety. The first thing I did was put my water on to boil so I could get the oats in and simmering while I got everything ready for this delicious bowl. I was also getting the rest of our breakfast ready...Applegate chicken sausage and eggs. I can't tell you the last time I didn't have eggs with my breakfast, we love our eggs here. Anyways back to the oatmeal, I will share with you my recipe, but first a few health benefits of steel cut oats, which in my humble opinion blow the rolled oats out of the water. Nutrient Dense- there are plenty of nutrients in just 1/4 of steel cut oats. 5g of fiber, 5g of protein, and its also rich in iron and B vitamins. Aids in Weight Loss- The fact that the steel cut oats haven't been cooked as processed quite as much as the rolled oats means that more of the fiber and protein is retained. This means your bowl of oats can help you stay full longer and keep the mid-morning munchies at bay. Helps Control Blood Sugar- The fiber in steel cut oats called beta-glucan has been found to keep your blood sugar levels stable in the morning and makes it easier to keep it stable all throughout the day, especially if you are eating fiberous rich foods at the rest of your meals. May Help to Lower Cholesterol- studies have shown that the beta-glucan fiber helps to reduce blood cholesterol levels when consumed regularly. People who eat more daily fiber have been shown to have a decreased risk of developing heart disease. So if those benefits aren't enough to get you eating your oats, check out this article from PopSugar about Why Oatmeal For Breakfast is Best for Weight Loss. 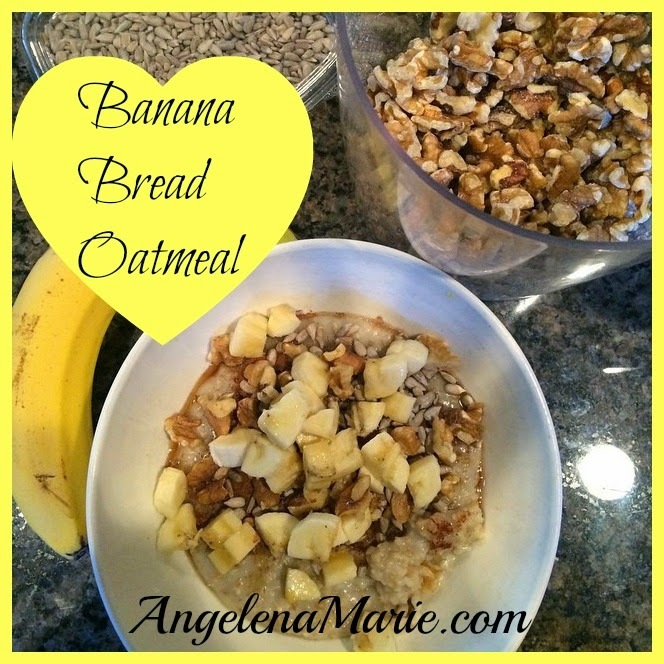 Now that you are fully convinced, here is the recipe for my healthy and delicious Banana Bread Oatmeal! *Bring water or milk to a boil, add in oats. Let simmer on low for 15-20 minutes until liquid is absorbed. Place in bowl, top with walnuts, sunflower seeds, banana and sweetener (if desired). Mix well in bowl and ENJOY! I hope that you give this Banana Bread Oatmeal a try, it will become a morning staple in our house for sure. If you do try it please come back and let me know what you think.